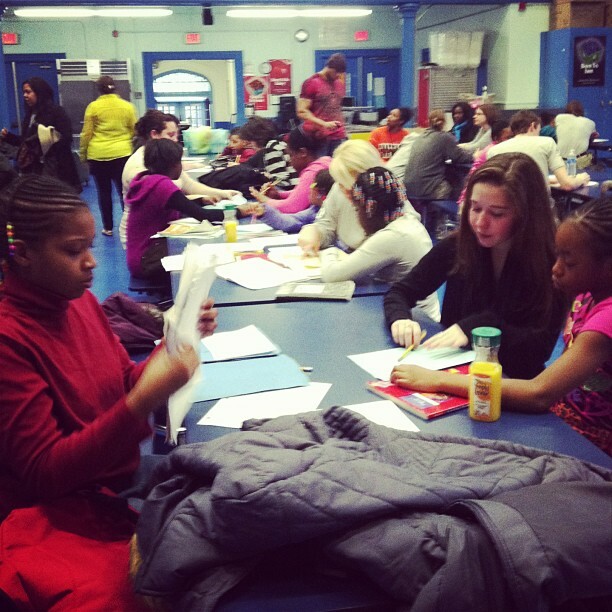 This week was a big week for mentoring at Pass It Along. We kicked things off on Saturday where we headed down to South 17th Street Elementary School in Newark for our new Saturday School program. Twenty volunteers attended and worked with twenty-five South 17th St. students, preparing them for their state testing in May. Twyla, the Communities in Schools Site Coordinator, selected students who have struggled academically. We were introduced to the students and then paired off with a mentor. Each volunteer had no more than 2 students to work with. Students brought their own homework and for those that did not, their teachers supplied them with work. As I walked around the room listening in on mentor-mentee conversations I could feel the kids opening up. One volunteer approached me telling me her students hadn’t eaten yet for the day, Twyla immediately ran to her office and gave them her own personal snacks. As time passed the need for our help became more and more apparent. While each mentor-mentee relationship was different the feedback was the same; all volunteers left feeling like they had given back and really accomplished something. After an inspiring weekend I was so prepared for our next mentoring program starting on Monday. Our newest local mentoring program is being held every Monday at the Merriam Avenue Elementary School. This program was opened up to primarily Newton High School students. We organized the program with the school guidance counselor, Deidre Iuliani and she selected the students based on various needs. Some of these needs included academic support, issues with focusing and social and behavioral issues. Eight Newton High School students participated and worked with nine 4th grade students from Merriam Ave. We started the day off with name games and ice breakers. The students took to our volunteers within minutes and were already claiming their buddies. We broke out into group play where volunteers and students played games, built with Legos and got to know each other. Lastly, we finished with homework help. Some students who had been identified as students in need of additional academic support worked one on one with a volunteer and few students worked in small groups. As usual, I was amazed with our volunteers and their willingness and enthusiasm in this program. They took these students under their wing and by the time we were leaving there were hugs all around. To me, mentoring programs make such a huge impact on young students and these two new programs are a true testament to that. Each program ended in extremely high spirits with volunteers and mentees saying heartfelt goodbyes and already talking about the next time they’d see each other. I am so happy to be a part of both of these programs and I see so many more opportunities coming out of this. As we look to the next few sessions, and our third mentoring program at Franklin Elementary, I can honestly say that I know we will be making a difference with these kids, whether its academic or social. Our volunteers represent the best that we have here at Pass It Along and with their help these students will truly be impacted. For now, let the mentoring madness begin! Click here to volunteer for one of our upcoming mentoring program dates. Yesterday, February 14th, marked my first full month at Pass it Along…and what a month it has been! My first week, I saw two huge events that were the result of a ton of effort and planning on the staff’s part long before I arrived: Dodgeball and the National Day of Service project for Martin Luther King Jr. Day. While thinking back to those events, while I remember still a bit overwhelmed and adjusting to my role within the organization, I also remember being equally impressed with the dedication of the students and staff that make Pass it Along such a great team to be a part of, as well as the incredible impact and reach that these dedicated people make in their communities. The MLK Day project especially made me so excited to dive right in to whatever PIA would plan next. Programmatically, Pass it Along has added quite a few new opportunities in the last four weeks: Extra senior citizen service days at Bristol Glen; mentoring opportunities at not one, not two, but THREE middle schools in the area, including Newark South 17th Street school; Girl Power, an effective and meaningful program where high school girls work with middle school girls on a variety of important “tween” topics; and three new hurricane relief projects, including a large-scale event in April that will be one of our Global Youth Service Day endeavors. Wow! In the office, there has been a concerted effort on the part of the whole staff to increase operational effectiveness, and we’re getting a head start on our spring cleaning. As we take a fresh approach to the programs we build and the ways in which we serve, it became apparent that we could use some “purging” in and around our office. As we rearrange, repurpose and recycle, I am confident that the effect on operations at PIA will be noticeable. Finally, just this week I had a chance to be introduced to the PIA board members at their monthly meeting this past Wednesday. While certainly a non-traditional setting (does any other board play “Name That Tune” to kick off the evening? Have members as young as 8 being honored for their service? Encourage playfulness and reflection in equal measure? I think not! ), it actually seemed more productive than any of the other board meetings I have been in attendance for at other organizations. It was also great for me to be able to put faces to names we hear so often in the PIA office. I have a confession to make, too: originally, I was only planning to stay for my introduction… but I was having such a great time, and the meeting was so inspirational and informative, that I ended up staying for the entire thing. I can confidently say that our board is an amazingly dynamic group of people, and their dedication to PIA is palpable. Second confession: I’m actually looking forward to the next one! It has been a momentous month. I can’t wait to see what the next four weeks bring. As a former part-time resident of a shore community, I watched the disaster Hurricane Sandy wrought with a heavy heart. As Sandy was happening, and the initial reports of incredible, unprecedented damages started coming in, I was across the country. My reaction to the devastation was compounded knowing there wasn’t much of a tangible impact I could make from 2400 miles away. I’m a very “hands-on” person, and wanted so badly to be able to be a part of the field response, so I could make a real difference for the communities and people that were forever altered as a result of this historic storm. Luckily for me, since the disaster I have had the wonderful opportunity to get involved in on-the-ground response efforts, first as a park ranger, and now as an AmeriCorps member at Pass it Along. There are still so many relief projects that are in the works—even now, over 100 days since the storm, there are still people whose homes have not yet been gutted for flood damage, or who are living without heat in their homes. There are parks, shorelines and other wild places still full of debris, relegated to the bottom of the priority list as people dealt with losing their homes, businesses, transportation, and in some cases, their livelihoods. Getting back to “normal” is an incredibly daunting task, one that can only be achieved with LOTS of external support and assistance. There is still so much to be done, and many people and places that need our—your—help! As part of its commitment to be a continual force for good, Pass it Along will schedule projects for hurricane relief throughout 2013. The estimated recovery timetable for Sandy is in excess of seven years. Won’t you be a part of the solution? Check out the events PIA has coming up, and support a cause that continues to be top-of-mind for thousands as they rebuild their homes, their businesses, and their lives. This month, we’re headed to Long Beach Island for a park cleanup on the 23rd. We’re facilitating a corporate group’s community service day at a cleanup site in March, and we’ve already committed to providing as much manpower as we can muster for a massive beach sweep as one of our Global Youth Service Day initiatives in April. More projects will be posted as they become available. I’m continually keeping my ear to the ground for appropriate opportunities for our youth volunteers, and welcome input from the Pass it Along crowd if anyone else hears of other projects or events that would be a good fit for our volunteer base. Please don’t hesitate to call the office or email me (maren@passitalong.org) if you come across something. I’m looking forward to hearing from you all, and I’ll see you out there!